Not to be confused with the many species that use verbena as part of their common name - lemon verbena, for example - true verbenas are a flowering plant, commonly known as vervain, known for their diversity of flower color and ability to attract butterflies. The majority of those used in landscaping grow as low spreading groundcovers. Verbenas are sun-loving perennials, though they are often grown as annuals in cold climates. Even where winters are mild, they rarely live for over two or three years, so many gardeners treat them as annuals. The low-growing types are useful in the foreground of flowerbeds as a way to soften the edge of the planting area. Verbenas' biggest claim to fame is their long bloom season - typically from mid-spring until the first frost. 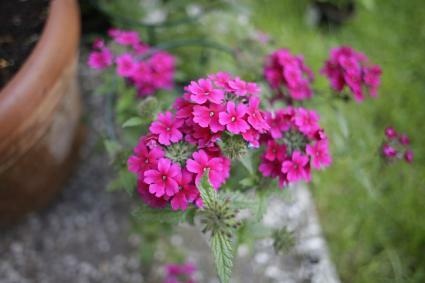 As other annual or perennial flowers come and go, verbenas keep on blooming. Purple is the default color for verbenas, but many other varieties have been developed. Trailing verbenas are groundcovers are commonly used where they will cascade over a wall or the edge of a pot. Homestead purple is a classic variety known for being tough and adaptable and grows up to 12 inches in height. Summer Blaze has bright red blossoms. Snowflurry has white flowers and more of an upright growth habit compared the other trailing verbenas. Moss verbenas are the lowest growing verbenas with foliage that is so finely cut it resembles moss. They are useful in rock gardens. Imagination is a common purple variety that stays less than four inches tall. Edith is similar in appearance but has pink-tinged lavender flowers, which are wonderfully fragrant. Sissinghurst has salmon-colored flowers and is known as a prolific bloomer. Upright varieties are less common than trailing ones, but these tall-growing varieties are perfect in the back of perennial borders. 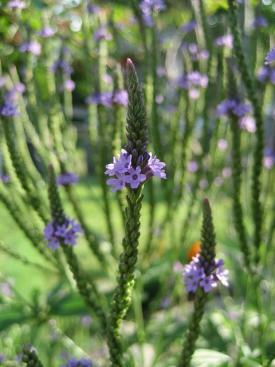 Blue vervain is a native North American species with flower stalks up to six feet. 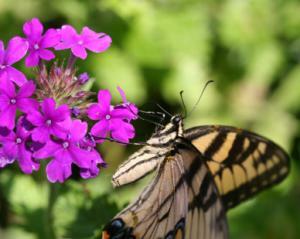 Verbena rigida, a South American species, has flower stalks up to four feet tall. Verbenas are considered easy to grow, with sun and good drainage being the main keys to success. They are typically planted in early spring. Verbenas thrive in soil enriched with compost, but as long as the soil is well-drained and of modest fertility, i.e. not heavy clay, they tend to do well. For best results, water once per week, unless there has been a soaking rain, preferably without getting the leaves wet. In pots, verbenas will need more frequent water and benefit from a monthly application of diluted liquid fertilizer. 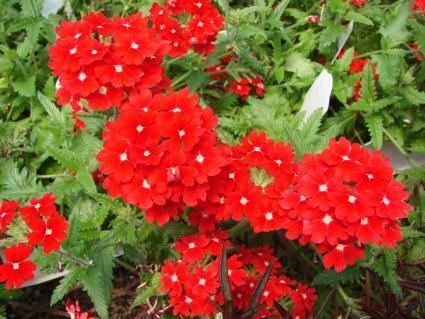 In the ground, however, they generally flower profusely without fertilizer. Trimming off the dead flower heads after the first major flush of blossoms in spring will encourage repeat flowering. The upright varieties can be cut to the ground in fall, while the groundcover varieties can be trimmed to within three or four inches of the ground in early spring, just before growth begins (that is, if they are being grown as perennials). Otherwise, there is little in the way of maintenance necessary with verbenas. Verbenas are a tough group of plants and if they are in poor health it is generally because they are not receiving enough sun or are receiving too much water. Powdery mildew, a greyish substance on the leaves, is common in both situations. Aphids and mites may occasionally show up, but are not usually devastating and can be remedied with insecticidal soap. 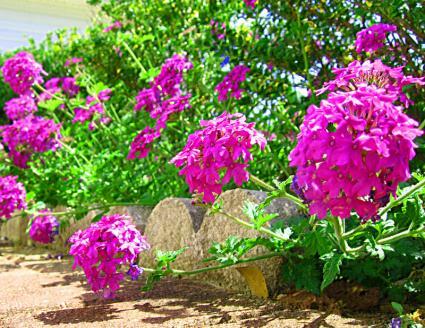 Verbena can now be found in many colors, but it will always be associated with the pure purple color of the basic varieties that are still common in flowerbeds everywhere. Whether one of the diminutive groundcovers or the tall stalky types, those purple flowers are also known for the butterflies that flock to them.